Have you heard the debates about using a stamp on a cookie? I know I have and it has stopped me from trying something that I really wanted to try. I totally understand the debate and I can see both sides. I had a tutorial on ‘How to Stamp on a Cookie’ planned a long time ago but decided not to share until I did a little research. Well, I have thought about it and I have decided to share some stamped cookies that I made. After researching I decided stamping on cookies is a personal choice. You must research and decide for yourself if it something you want to do. I made the decision to use the clear stamps with the clear blocks because I think they are easy to wash which will help bacteria from growing. Whatever your opinion is when you think about using a stamp on a cookie, I hope you can just sit back and enjoy these little guys today. I learned a lot my first time trying this and want to share what I have found with you. Begin by picking your food gel color and find some way to get it on your stamp. The reason I say that is because the paper towel I tried to use didn’t work well at first. The reason it didn’t work is because I didn’t lay the paper towel on a flat surface after I spread the ink on it. I had it on a plate that was curved and it didn’t work. Once I laid the towel flat, I got much better results. Half way through I remembered that I had purchased this Cut n’ Dry stamp foam pad and decided to try it. It worked great! All I did was cut off a square, dabbed some black food gel color on it, and began stamping and it was better than that first sip of morning coffee. Well, maybe that is taking it a little far but, trust me, it is way better than a paper towel. When I was done, I just slid it in a plastic sandwich baggie to keep it fresh so I can use it later. Before I try stamping again, I will buy one of these uninked stamp pad things. I found out where to buy it from Anita at Sweet Hope Cookies. Thanks Anita! Attach the stamp to the clear block and then dab it in the ink. Notice how messy mine is from trying to dab it on the paper towel when it was on the plate. DUH Lisa! You may need to dab a bit of ink off before you try to stamp your cookie. Then, carefully place the stamp on the cookie and press down. 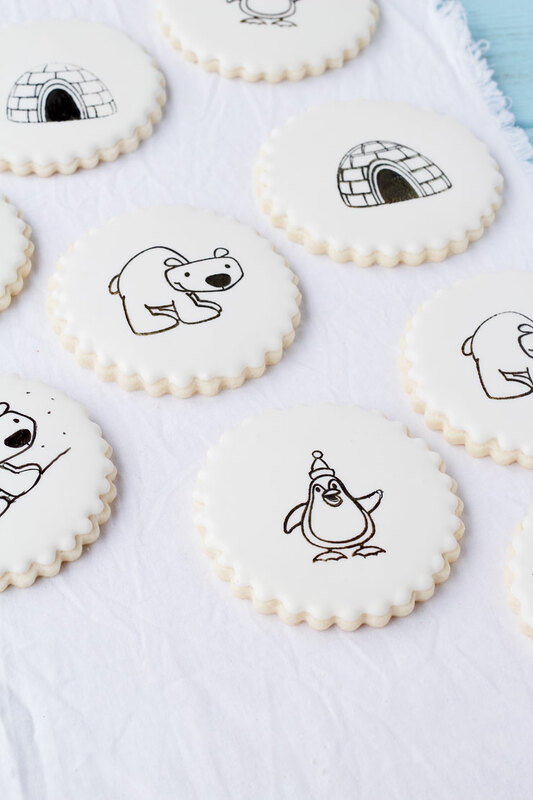 You may need to rock it slightly to make sure the entire outline transfers onto the cookie. Then, gently lift the stamp straight up off the cookie. Once you stamp the image on the cookie, you can call it a day and let it dry completely or, you can add a few details. 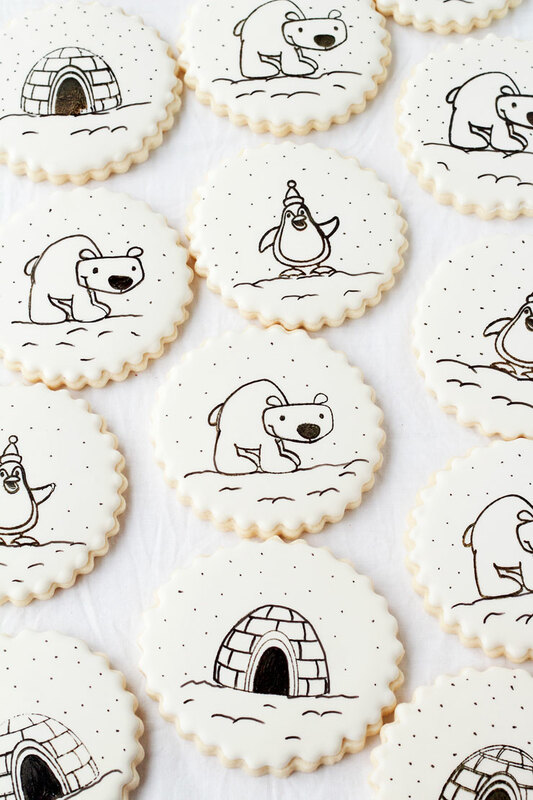 A few snow lines and snowflakes aka dots, is just what this cookie needed. I love the simplicity of these so I decided to stop here. If you want, you can paint or use food safe markers to color the little characters or use other stamps on a cookie. I say, “Go for it!” Paint or color away. Let’s talk about a few things that didn’t go to well. See this little penguins arm? It didn’t transfer properly so, use your black food safe marker and fix it. So simple! See the igloo? I lifted it slightly when I was pressing and it made a double line at the top of the igloo. Somehow, it only made two lines at the top so, I will chose to ignore it and pretend it is a masterpiece. Are you with me? 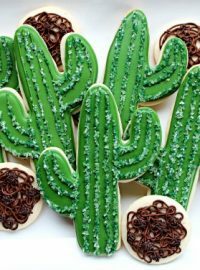 The best advice I can give you when you stamp on a cookie is to make extra cookies to use for practice and be honest with the people that are going to eat the cookie. I know some people who are very conserned about food safety and that is a good thing. I also know other who don’t worry as much about it. Either way, let the cookie eater make their own choice. If you decided you don’t want to eat them,, you can always use them for decorations. Hang them on your Christmas tree or use them as name tags on presents. 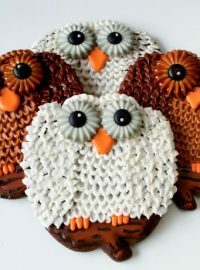 Stamping Cookies by Sweet Hope Cookies – You need to check out what Anita discovered about stamping with food gel vs airbrush colors. I want to ask: what marker do you use? 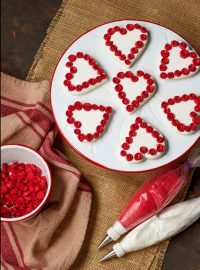 What sugar cookie recipe did you use? 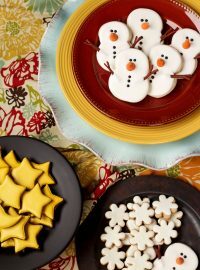 The scalloped edges on your cookies are beautiful as well as the stamps on the white frosting. 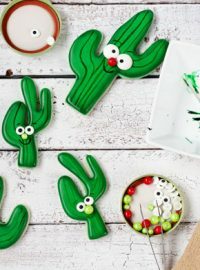 I made these with scalloped edge cookie cutters but cookie lost some of their shape during baking. 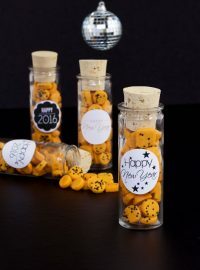 Lovely, I notice that the stamp pad is transparent, if it is not transparent, I think you will be stamping all over the cookies. Where can I buy these clear stampa for cookies? You can get them Wal-Mart, at a craft store, or on Amazon. You can find them almost anywhere. Now, that said, not all of them are food safe. You really have to look to see if they are and if they aren’t, you have to use your judgment if you want to use them or not.